Harry Leigh Pink photo, reproduced courtesy of the Leigh Pink family. Over the years the Legion of Frontiersmen has never been short of Chaplains. Particularly in London, churches have been keen to offer their places of worship as the official Frontiersmen church. One could suggest that the priest or minister has been keen to invite the Frontiersmen as it guaranteed him a substantial group of sinners in need of saving. It is likely that one of these is Trumpet-Major Hill. Every Legion chaplain has been a somewhat larger-than-life character who had experienced a life of adventure himself. We have covered several in the past on this page. 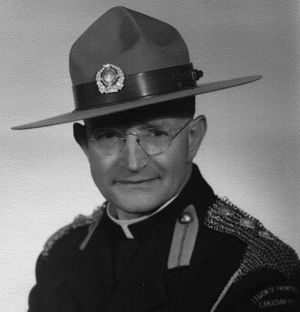 Legion Captain Harry Leigh-Pink joined in London but became Legion Chaplain to British Columbia Command in Canada. His simple frontier Christianity appealed to the Frontiersmen. He was also a prolific author writing western yarns, adventure stories for boys and even science fiction under a variety of nommes-de-plume such as Hal Pink. The following is a great Frontiersmen true story he wrote for the Canadian Frontiersman magazine in 1959..
London, England has always been ‘unofficial headquarters’ for restless footloose Britishers who wander to the wilder parts of the earth in search of adventure and profit. Like many another ‘younger son’ and seven thousand miles roving as a Special Correspondent, an extensive North American tour undertaken for the London General Press, tanned by the sun and wind I turned up in the fog and damp of the London winter of 1932 and was welcomed in to the Legion of Frontiersmen by the Founder, Captain Roger Pocock. London HQ Command met every Friday night in a clubroom over a pub near Victoria Station. The famous ‘Kaid’ Belton, British soldier-of-fortune who had trained and commanded the regiments of the Moroccan army, was the Commandant. I was sworn in and became a Frontiersman. “The ‘little feller’” was about five feet two inches in height, a man of middle age and built like a jockey, with powerful shoulders and hands. “Yes, I’ve a uniform jacket that a pal asked me to sell for him, just about your size, regulation dark blue with Frontiersmen brass buttons, steel shoulder chains. You can have it,” grinned the little feller, “for thirty bob!” Thirty shillings, at that time equal to $7.50, was a bargain price. “Come round to my place after the drill tonight and try it on,” suggested the little feller. Shortly after 10 p.m. my new comrade-in-arms conducted me out of the Command Headquarters into the fog. “We can walk it in ten minutes. Quicker than a bus,” he said, and off we trudged. The greater part of our way, from the Victoria Station region of London, was down a wide road along one side of which ran a high brick wall topped with iron spikes. At last my guide and jacket-seller halted in front of a huge wrought-iron gateway, and thrust open a smaller hinged portion to one side of it – what is known as a wicket gate – stepping through the gap. I followed him, and found myself peering through misty gloom at the enormous bulk of a black building far beyond. One or two lights showed up in the great pile. “Who goes there?” demanded a loud voice, and a foot of cold steel bayonet, attached to a long rifle, was thrust under my nose. Hastily the little feller interposed; “It’s me Jack,” he told the grey-overcoated sentry whose advent from the darkness had been so silent and startling, “and this chap’s a friend of mine.” “O.K.,” said Jack the sentry, and we set off across the tarmac towards the big building which I decided must be an army barracks. Striking a match, my host revealed against the wall of the building a wide iron staircase mounting upward in a series of flights and landings. “Follow me, close behind, soon be there, chum!” – and up we went, our right hands gripping the clammy iron railing. After several short flights I was conducted along an iron landing, past dark doors and windows, to a window which was lit behind drawn blinds. My host inserted a latch-key into a door, turned the knob, and ushered me into a short narrow passage illumined by flickering gas-light a la 1890 style. Two large framed and glassed steel engravings occupied most of the passage walls to right and left; if memory serves me, one was ‘The Battle of Waterloo’, and the other ‘The Death of Nelson.’. “Come in, come in, this is my little mansion!” said my host jovially, and ushered me into a small living-room as old-fashioned as the outside passage. Gas lights hissed in globes fastened to a center bracket. Set flush in the wall of the room was a fireplace with firegrate and hob and a small oven, gleaming with blacklead, a bright fire of coals burning in the grate, a kettle singing on the hob. In front of the tiny fireplace and over was a hearth with brass fender, fire-irons (poker, coal shovel, brush), and in front of the fender what has always been known in England as a ‘rag rug’ – this is a sheet of coarse sacking into the weave of which has been rammed with a small strips of coloured rags cut from old suits, coats, etc. Occupying most of the small room was a round table covered with a white cloth and set for supper – loaf of bread, butter on a dish, pot of jam, large tea-pot covered with a padded cloth ‘tea-cosy’ (a kind of cloth helmet which fits completely over the tea-pot leaving the handle and spout alone jutting out), plates, cups and saucers, etc. Crowding one wall was a Victorian horsehair-stuffed sofa (couch to you), flanking one side of the fireplace was its mate the horsehair-stuffed armchair, and rising to greet us with a smiling welcome was my host’s wife, a small woman with work-worn hands. “Meet the Missis!” One of the new men, come to look at a jacket”, said the little feller swiftly, by way of introduction. His wife and I shook hands. “Do you mind telling me what this place is?” I asked. Man and wife stared at me in astonishment. “Do you mean to say you don’t know where you are?” the chorused. I shook my head “Looks like a barracks to me.” They laughed outright. “No kidding. You really don’t know where you are?” enquired the little feller. The little feller seemed to grow visibly in stature. “When the King or Queen rides out of the Palace gates to open Parliament, or attend a State function, in the Royal Coach, it is pulled by six horses called the ‘Windsor Greys’. In charge of the team are heralds in royal livery with long silver trumpets, postillions who walk or ride the horses. 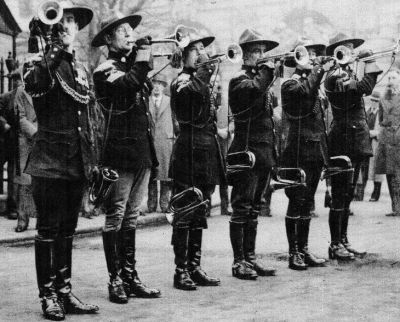 On the lead horse you will see me – I am Trumpet-Major Hill, a Royal Postillion!” he announced. That night I bought a Frontiersman’s uniform jacket in Buckingham Palace for thirty bob. I wore it for many years, and have it still. That night I sat down very comfortably at a Buckingham Palace fireside, and drank hot teas, and nibbled cheese, and wolfed down bread and jam, with the Royal Postillion and his wife, seated in the horsehair-stuffed armchair, with my feet on the rag rug. I have never met more pleasant people. To them I was just a raw rookie, newest volunteer of the Legion of Frontiersmen. They were far from rich in this world’s goods, housed in quarters reminiscent of the Baker Street sitting-room of Sherlock Holmes and Doctor Watson, but they treated me ‘like visiting royalty’, and down the years I raise my hat in salute, remembering the night they welcomed me into Buckingham Palace by the back door. There have been Frontiersmen in all walks of life over the years, but Trumpet-Major Hill has to be the first one we have discovered who lived at Buckingham Palace. The article above was originally published on http://www.frontiersmenhistorian.info in October 2010. This entry was posted in Archive Topics, Frontiersmen, Legion of Frontiersmen and tagged Buckingham Palace, Hal Pink, Harry Leigh Pink, Kaid Belton, Royal Postillion, Trumpet-Major Hill, Vahd W Tobin. Bookmark the permalink.